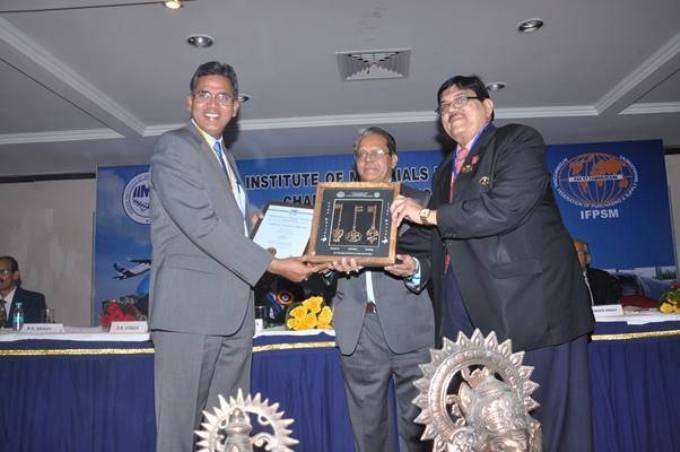 Prof. BS Sahay, Director IIM-Raipur was conferred an honorary Fellowshipby the Indian Institute of Materials Management (IIMM). The Fellowship is a rare honor that was bestowed upon Dr. Sahay for his lifetime contribution in the area of logistics, supply chain management, operations and materials management. Dr. Sahay has over 31 years of experience. He was the founding director ofIndian Institute of Management – Raipur and wasalso the director of two colleges of national level – IMT Ghaziabad, MDI Gurgaon. He has published over 140 research articles national and international journals. In his career, Prof. Sahay has influenced not just several management scholars but also the management thought especially in the area of supply chain. Several of his papers have had a deep impact on supply chain logistics and management. Prof Sahay was conferred the fellowship during the National conference of materials management (NATCOM) organized in Chandigarh by IIMM. NATCOM is an Annual Convention that is held for supply chain professionals and practitioners. The two day Convention attempts to share the latest trends in the field of Supply chain management with top level managers and academics in the area of supply chain, logistics, materials management and procurement from all over the country. Prof. Sahay delivered the keynote address during the inauguration of the event. Prof. Sahay stated that supply chain management is the back bone of International and domestic trade & commerce. He pointed out that India’s cost of logistics is more than 12.3% of its GDP as compared to 8.2% of United States. “It is important to reduce this cost because inefficiencies in logistics raises cost of trading and reduces the potential for global integration”, he said. He also pointed out that India’s position in logistics performance index is 54th out of 160 countries and urged all the delegates to improve this by improving efficiency in customer and border clearance, transportation infrastructure, quality of logistics services. He said improvement in quality of logistics services and usage of web enabled technology can further help the country improve India’s competitiveness in the world. Apart from dignitaries like Mr. Lalbhai Patel, National President, IIMM andMr. MK Bhardawaj, Chairman Board of studies, IIM the conference was attended by over 300 delegates from the industry and academia. IIMM is a National Apex body representing a wide spectrum of professionals engaged in various facets of Material Management, responsible for planning, sourcing, Logistics & Supply Chain Management. It has a wide network of 45 branches and 18 chapters having over 8000 members from both public and private sectors. Its activities include conducting Executive development programs, seminars, workshops, in-house training programs and consultancy assignment, Advance Materials Management Programs & Research Programs in the area of supply chain and logistics. The Institute is a chartered member of International Federation of Purchasing and Supply Management (IFPSM), Atlanta (USA) Incorporated in Switzerland. The Institute also conducts a Graduate Diploma Course in Materials Management (GDMM) recognized by Govt. of India for appointment of senior posts and services under the Central Government and also accredited by IFPSM. It also conducts a three-year Post Graduate Diploma Course in Materials Management (PGDMM) by correspondence and Diploma in Logistics Management which is a high profile one year distance education program.